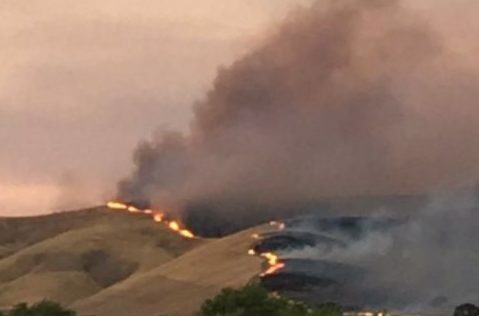 Firefighters have established full containment of a blaze burning along San Luis Obispo County’s northern edge and have nearly accomplished the same with a fire in Santa Margarita. Meanwhile, firefighters are starting to gain control of the Alamo Fire that has ravaged southern SLO County and northern Santa Barbara County. As of Tuesday morning, the Alamo Fire has burned 28,926 acres and is 45 percent contained. Containment jumped 30 percent between Monday morning and Tuesday morning. The Alamo Fire ignited last Thursday off Highway 166 near the Twitchell Reservoir in San Luis Obispo County. The fire has destroyed one home and is threatening 133 structures. More than 2,000 firefighters are battling the blaze. Evacuation orders remain in effect for residents of Tepusquet Canyon, and Highway 166 is closed from Highway 101 to New Cuyama. Along SLO County’s northern boundary, the Parkfield fire is now 100 percent contained. The blaze burned a total of 1,816 acres. The Parkfield Fire started around 6:30 p.m. Saturday near the San Luis Obispo-Monterey County line. The blaze burned in an area between San Miguel and Parkfield. On Saturday evening, a firefighter suffered second degree burns while battling the blaze and was evacuated by air. The Parkfield Fire burned at least one structure. At about 7:15 p.m. on Sunday, the Stone Fire sparked along Huer Huero Road east of Santa Margarita. The Stone Fire has burned 340 acres and is 95 percent contained. Full containment is expected to be achieved Tuesday night, and evacuation orders in the area have been lifted. The Stone Fire burned at least seven structures, one of which was a home. In Santa Barbara County, the Whittier Fire is still burning near Lake Cachuma south of Highway 154. As of Monday night, the Whittier Fire had burned 10,823 acres and was 25 percent contained. Containment increased 20 percent between Sunday and Monday nights.